This book is the culmination of decades of teaching and research by one of the foremost historians and theologians of the Baptist tradition. Garrett’s work is huge and intimidating at over 700 pages, but it is a once in a lifetime kind of work. This book focuses on Baptist theology primarily by considering theologians and statements of faith. Garrett also adds commentary at the beginning and end of sections in order to give some context or reflection, such as on Early American Baptists or Baptist Landmarkism. 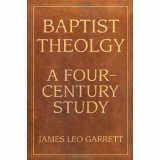 Garrett also provides discussion on major issues of Baptist identity, such as origins, major turning points, authority, and distinctive. The wealth of the book is in the presentations of theologians. The essays on each figure are focused on theology and not so much on biography and are kept usually between three and six pages. Considering that this book is over 700 pages, you can see how many theologians he covers in that span. Nearly every major Baptist theologian, both major and minor, is considered. From first thinkers like John Smyth,Thomas Helwys, and John Bunyan to contemporary theologians like David Dockery, John Piper, and D.A. Carson, Garrett’s survey is impressive. Garrett’s book is worth reading cover to cover, but most will use this as a sort of encyclopedia. Whenever you wonder about a theologian and their theology, and perhaps who is writing about that theologian, then you can turn to the correct page and find what you are looking for. Why Do We Have Baptists in the First Place?